Even as the two sides share common concerns over Japan’s recent aggressive stand on honoring war criminals, Chinese President Xi Jinping and his South Korean counterpart Park Geun-hye met in Netherlands on Sunday to boost ties. “Both sides should maintain close high-level exchanges, speed up negotiations on the China-ROK free trade pact and reach an agreement at an early date,” Xi said. The two Presidents met in Noordwijk ahead of the Nuclear Security Summit that opens in Netherlands this week. South Korea and China concluded a new round of negotiations on the bilateral free trade agreement (FTA) last week. The 10th round of talks furthered discussions on goods liberalization, service, investment and rules. 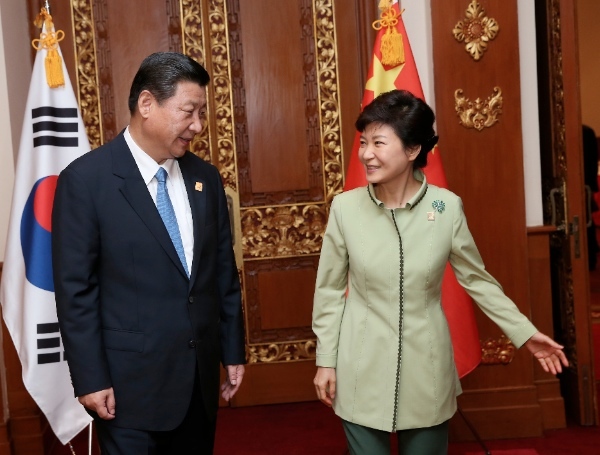 Xi and Park also exchanged views on the situation on the Korean Peninsula, according to an official statement. The situation has generally been eased so far this year and the South-North relationship improved, said Xi. Beijing plans to continue to support better ties between the Koreas, asserted the Chinese President on Sunday. Xi however pointed out that the Korean nuclear issue is “complicated” and all sides should grasp the opportunity of the current eased situation on the Korean Peninsula for an early resumption of the six-party talks. China and South Korea also discussed the planned war memorials to honor Chinese and Korean soldiers. The South Korean President thanked Xi for the establishment of a memorial by the China to commemorate Ahn Jung Geun, a Korean patriot who died in a war with Japan in 1909. China is also constructing a memorial stone at the former barracks of the Korean Liberation Army in the northwestern Chinese city of Xi’an.